Bi-level homes, also known as a “colonial split," have a landing halfway between the two floors of the home. Because many bi-level homes are below grade, where the first floor of the home is partially below ground, proper landscaping is essential in creating a harmonious and unified space. Their boxy appearance is lifted and their large pictures windows enhanced with cascading plant varieties that bring in texture and shape to the home. Bi-level homes generally have a staircase leading up to the front door that is often connected to a path that leads to the driveway. To create a smooth transition from the entryway down to the other areas of the home, line the path with perennial flowers. Perennial flowers only need to be planted once to shoot up year after year, fuller and healthier. Flanking the path or walkway leading to and from the bi-level house, plant low-growing perennials like Serbian bellflower. Growing 6 to 12 inches tall and 1 to 3 feet wide, the lavender blooms light up the path with color. Serbian bellflower has a long blooming period and is also low maintenance. The 1-inch star-shaped flowers emerge in late spring to last into fall, creating a long-lasting plant variety. Serbian bellflower can be divided in spring or fall to grow in other areas of the garden. The USDA Hardiness Zones for planting are 3 to 9. Typical of bi-level homes, the windows on the first level are often at hip level and covered up with large, overpowering shrubs. To allow more light into the first level and help bring in color to the landscape, grow low-growing evergreen shrubs. Evergreens have the ability to retain their foliage and green color all year long, including winter when moist other plants are in their dormant stage. Evergreens are ideal for bi-levels because they keep color and life near the house and when planted along the front of the home, help to bring privacy to the home. A hardy evergreen like gardenia keeps its color throughout the year but does not overpower the windows. 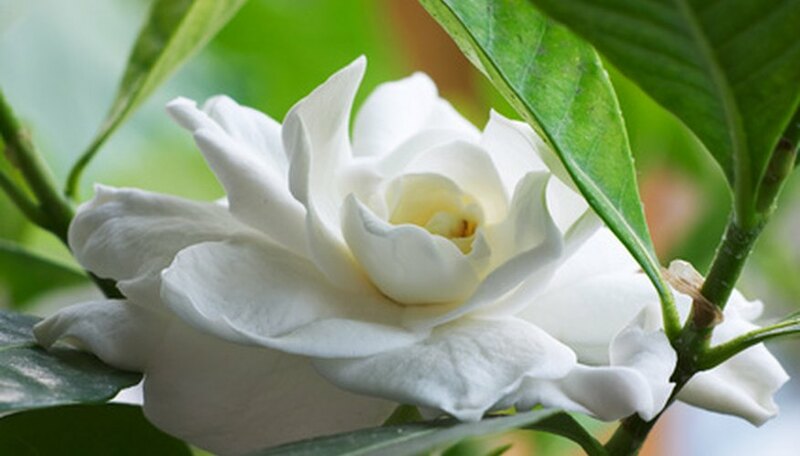 Growing 3 feet tall and wide, gardenia have 2-inch, fragrant white flowers that light up the home with subtle color. The dark green leaves contrast with the pale blooms to create a striking display. The USDA zones for planting are 7 to 10. Framing the bi-level home, plant a taller evergreen shrub like Russian sage to bring in vibrant color and their upright, clumping shape. Growing up to 5 feet tall and wide, Russian sage has violet to blue flowers that grow on 9- to 12-inch long panicles. Blooming in late summer, Russian sage is also drought-tolerant, ideal for a low-maintenance landscape. The USDA zones for planting are 5 to 8. Along the front of the home, plant a specimen tree to draw you eye into the space and create a focal point to the bi-level home. Specimen trees are grown in a wide range of shapes, sizes and colors, to fit into small or large bi-level landscapes. Pick a tree that does not overpower the yard but blends in with the surroundings. A small tree with a slow growth rate is ideal for keeping the exterior looking open and requires less pruning over time. A hardy and long-lasting specimen tree is the Japanese maple. Japanese maple trees come in a range of sizes, with some dwarf Japanese maples small enough to plant inside a container. Their fiery fall colors and attractive spreading branches create a magical effect to the bi-level home. Some Japanese maple trees have rounded tops that cascade down to touch the ground, creating a canopy beneath, while others are vase-shaped or upright. The foliage colors on Japanese maple trees range from purple and red to yellow and bronze. The USDA zones for planting are 5 to 8.